Comments: Wood Storks are among the largest of the waterbirds found in North America. The white body, bare, black head and neck, massive bill, pinkish-yellow feet and black posterior half of their wings and tail make them unique. Their primary habitat is the wooded swamps of the southeast where they are sensitive to local water availability. Regional droughts and drainage have resulted in federal listing as an endangered species. 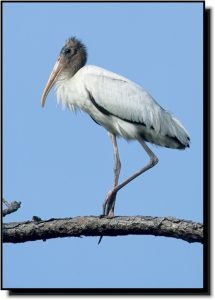 Wood Storks occur in small numbers or are found only in localized sites within the Great Plains.